Here at The Tramways Hotel in Bolton, Lancashire, we offer budget hotel accommodation close to Bolton town centre that is great value for money. You can stay with us from just £28 per night. Our newly-refurbished bed and breakfast hotel accommodation in Bolton features 14 rooms, including single, double and family rooms. There are showers and toilets outside the rooms. We serve a full English breakfast and an evening meal can be provided on request. Our new contemporary interior features a welcoming bar and restaurant. Our rates are very competitive and compare very favourably with other Bolton bed and breakfasts, Bolton guesthouses and Bolton hotels. Make sure you stay at the best budget bed and breakfast hotel in Bolton when you visit this attractive former Lancashire mill town. 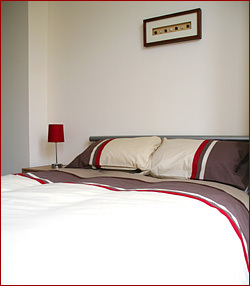 Our cheap hotel accommodation always delights our guests with its good value and friendly, personal service. Located close to the Reebok Stadium and the University of Bolton, as well as to the many attractions and destinations of England’s Northwest, it’s a great place to stay. If you want a cheap bed and breakfast in Bolton that delivers good quality and value for money choose The Tramways Hotel. Give us a call for further information or to book a room.